^ Khaas, Tebogo (5 November 2017). "Black Monday: We are going backwards". News24. Retrieved 6 November 2017. ^ editorials (27 October 2017). "Top cop position is a poisoned chalice". The Citizen. Retrieved 6 November 2017. ^ "Western Cape's police shortage receiving 'lots of attention' – top cop". News24. Retrieved 10 October 2016. 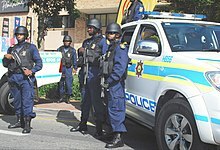 ^ "Public hearings to be held over police shortages in Western Cape". News24. Retrieved 10 October 2016.